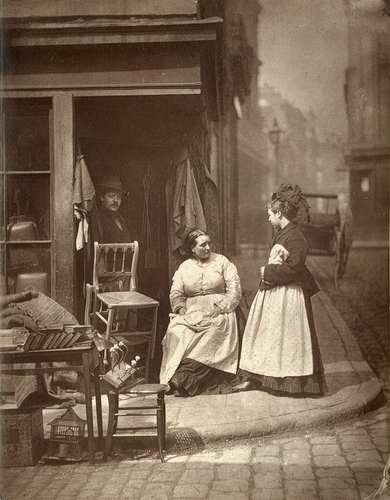 "At the corner of Church Lane, Holborn, there was a second-hand furniture dealer, whose business was a cross between that of a shop and a street stall. The dealer was never satisfied unless the weather allowed him to disgorge nearly the whole of his stock into the middle of the street, a method which alone secured the approval and custom of his neighbours. As a matter of fact, the inhabitants of Church Lane were nearly all what I may term "street folks" - living, buying, selling, transacting all their business in the open street. It was a celebrated resort for tramps and costers of every description, men and women who hawk during the day and evening the flowers, fruits and vegetables they buy in the morning at Covent Garden. When, however, the question of improving this district was first broached, Church Lane stood condemned as an unwholesome over-crowded, throughfare, and the houses on either side are now almost entirely destroyed, and the inhabitants have been compelled to migrate to other more distant and less convenient parts of the metropolis."